SUBHEAD: U.S. 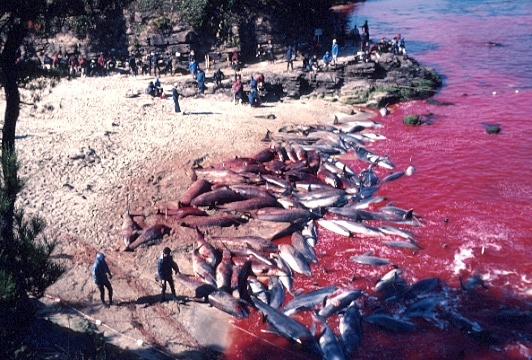 Ambassador to Japan Carolyn Kennedy criticizes Japan's traditional dolphin slaughter. Image above: Every year the fishermen of Taiji, in western Wakayama prefecture, drive hundreds of dolphins into a cove, select some for sale to marine parks, release some and kill the rest for meat. From (http://life-sea.blogspot.com/2011/08/life-of-dugong.html). New Ambassador Caroline Kennedy Shocks the Japanese with strong criticism of Japan's cruel dolphin slaughters. What comes next? Tough talk from the U.S., but the Pentagon's shift of military forces to the Asia-Pacific region that may have its own impact on marine ecosystems. Cetacean lovers are celebrating the recent, brash statement of newly appointed U.S. ambassador to Japan, Caroline Kennedy, in her condemnation of Japan’s tradition of dolphin slaughter. Now that she finds herself professionally and geographically smack-dab in the middle of Obama’s “Pacific Pivot” toward Asia, she has the opportunity to bring more to light on the veritable ecological holocaust taking place in the Asia-Pacific. While the Pentagon describes the Pacific Pivot as a shift of military forces to the Asia-Pacific to counter a rising China, we hear precious little about how this plays out environmentally. The military pivot is reigning terror over cetaceans, coral reefs, migratory seabirds and marine ecosystems throughout the vast, dying Pacific Ocean. Local residents in Okinawa, the Mariana Islands, and Jeju Island (South Korea) are the communities that have been most vocally opposed to the plan to blanket the Asia-Pacific with destructive military bases. The most appalling example is the proposed Mariana Islands Training and Testing region (MITT), which would open up approximately one million square miles of open ocean to full-spectrum, year-round live-fire military practice, over an area larger than the states of Washington, Oregon, California, Idaho, Nevada, Arizona, Montana and New Mexico, combined. It would also include the whole of the supposedly “protected” Marianas Trench Marine National Monument, established by President Bush in 2009. Full-spectrum” live-fire military exercises means year-round amphibious attacks, bombing, torpedos, underwater mines and other detonations from the air, from the sea, and from the ground, as well as sonar training that will result in permanent hearing loss for scores of whales and dolphins. The U.S. military has been conducting such full-spectrum live-fire training for the past three-and-a-half years over a half-million square miles of the open Pacific, and also upon the island of Farallon de Medinilla. Farallon de Medinilla, once teeming with pretty commonplace sea life and rare migratory birds, has been bombed and disfigured to unrecognizability. On Guam, the most southerly Mariana island, the military is planning on dredging over 70 acres of one of the world’s healthiest and most vibrant coral reefs, to make way for a nuclear-powered aircraft carrier. Scientists say that, if the project is allowed to move forward, the reef will be destroyed before many of its endemic species can even be discovered, let alone saved. 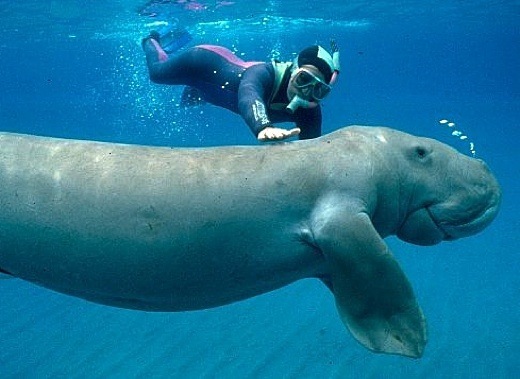 Image above: A scuba diving man and a dugong. There are only about 50 Okinawan dugongs left at Henoko Bay, the best remaining habitat for the endangered species, and the proposed site for a land-filled military airfield. From (http://life-sea.blogspot.com/2011/08/life-of-dugong.html). Further west, the Pentagon is eyeing Okinawa’s most lovely, pristine bay, at Henoko, to build yet another base. Okinawa already contains 38 military facilities and 26,000 troops. In a 2009 letter to President Obama, over 400 environmental organizations urged him to cancel plans to build the base, in order to preserve the best remaining habitat for 50 Okinawan dugongs, a rare manatee that is a cultural treasure in Okinawa. But Obama never responded, and now, five years later, Defense Secretary Chuck Hagel has called the base construction “absolutely critical” to regional security. Okinawans, however, see nothing “secure” about the irreversible destruction of their land and resources by U.S. forces. After decades of rapes, crime, noise pollution, aircraft crashes, continual contamination of land and water, and a host of other base-related evils, the Okinawans believe real security will come only when the troops are out entirely. And to the north, on the southern Korean island of Jeju, villagers have been conducting a 24-hour protest vigil for the past seven years, outside the construction site of a high-tech navy base being built by the South Korean government to function as a key nexus in the U.S. military pivot. Nearly half completed, the base is intended to house up to 8,000 marines and 20 warships, including nuclear submarines, giant aircraft carriers, and destroyers equipped with cruise missiles. It is being constructed in an area rich with spectacular soft-coral habitats that provide sustenance to Korea’s only remaining pod of dolphins, and is directly adjacent to a UNESCO Biosphere Reserve. Tragically, much of the coral has been dredged, leaving the dolphins to perish. 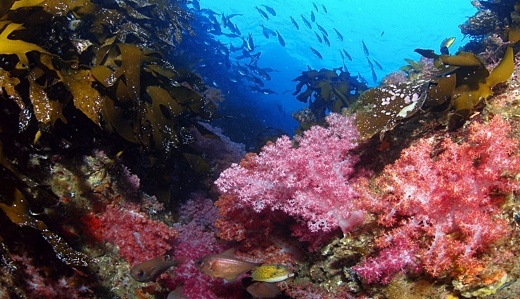 Image above: Photo of sacred and spectacular soft corals of Gangjeong on Jeju Island, Korea, by Katherine Muzik, Ph.D. From (http://savejejunow.org/sacred-spectacular-soft-corals-gangjeong/). On land, Jeju base construction has cemented over a one-mile stretch of what was once a wondrous rocky wetland bubbling with pure freshwater springs. The area had served as a unique breeding ground for over 500 species seaweed and 86 species of unusual shellfish, as well as three endangered species: the red-footed crab, the endemic Jeju freshwater shrimp, and the boreal digging frog. As recently as two years ago, this coastline had provided the village with the Earth’s finest nutrition for the past several thousand years. Today, this once-thriving ecosystem is dead, and villagers must look for jobs to survive– perhaps at one of the many fast-food joints sprouting up to accommodate the new base economy. Regardless of which nation is to blame, the death knell tolls for all marine creatures in the Asia-Pacific. Ms. Kennedy, who clearly cares about the humane treatment of all living things, is in a position to make a difference at this critical juncture in environmental history. Let's hope she can bring equal attention to how the American tradition of militarism is ravaging our average ocean, just as she has spoken out on the barbarity of Japan’s dolphin-hunting tradition. That would give the cetaceans real reason to rejoice. • Koohan Paik is a journalist, media educator, and Campaign Director of the Asia-Pacific program at the International Forum on Globalization. She is also a Fellow with the Korea Policy Institute. In 2011 and 2013, she helped to organize the Moana Nui conference in Honolulu, which brought together international activists, scholars, politicians and artists to consolidate Asia-Pacific discourse as it relates to geopolitics, resource depletion, human rights and global trade. She is the co-author of The Superferry Chronicles: Hawaii’s Uprising Against Militarism, Commercialism and the Desecration of the Earth, and has written on militarism in the Asia-Pacific for The Nation, Progressive, and other publications.